Anyone signing up as a new Betfair Casino customer is eligible for a Welcome Bonus worth up to £200. The introductory bonus program applies to the first three deposits made, with a 100% match up to the initial £100 deposited, 50% up to £50 on the second deposit, and another 50% up to £50 on the third. For those who prefer a higher level of play and reward, there is also a “mega first deposit bonus” available, amounting to £500 awarded on any deposit of £1,000 or more. Owned and operated out of Malta by The Sporting Exchange Limited, Betfair Casino is part of a gaming network that serves some three million registered customers and handles over five million transactions a day. Registration on the casino web site allows access to all of the group’s resources, including the world’s largest online betting exchange, arcade games, exchange games, and poker. Powered by Playtech software, Betfair Casino uses English as its primary language, with mirror sites offered in nine other European languages. Deposits are accepted in ten currencies, and the site’s basic unit is the British Pound Sterling. 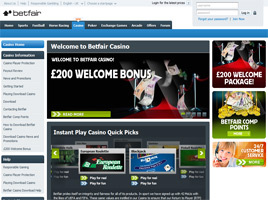 Two different versions of Betfair Casino’s games are available online: Download and Instant Play. Both of them offer a risk-free “play for fun” mode as well as the real money “play to win” option. This makes it easy for prospective players to evaluate the games prior to signing up and opening a cash account. The games are classified into six categories: Card Games, Table Games, Slot Games, Video Pokers, Arcade Games, and Scratch Games. A special tab called “New Games” allows quick access to the very latest installations, such as the Incredible Hulk, Gladiator, and Blackjack Switch. Players can also create their own quick access to often-played games in a special “Favourites” section. Eighteen different Jackpot Games are available across the various categories. Among Slot Games they include Beach Life, Cinerama, Diamond Valley, and more. There is Progressive Blackjack and Caribbean Stud Poker among table games, along with a jackpot-version of Jacks of Better for video poker enthusiasts. Even the scratch cards, like Genie Hi-Lo and Jackpot Darts, provide ways to win huge prizes. A recent audit of payouts at Betfair Casino showed the Slot Games with a “Return to Player” (RTP) ratio of 94.18%, while the Table Games were loosest at 98.98%. Across the board, Betfair Casino had an RTP rating of 98.13%, making it one of the best bets on the Internet for cash players. A relatively new innovation at the Download casino is the Betfair Comp Points system. All customers are automatically enrolled, and Comp Points earned are based on the games played and amounts wagered. For example, for every £100 spent on Slots & Other Games 30 points are awarded. For Video Poker, Card and Table Games, £100 earns 10 points. As soon as 100 Betfair Comp Points have been accumulated, they can be converted at the cashier at a rate of £1 cash for every 100 points redeemed. There are no limits on earnings or redemption. The Comp Points also count toward additional rewards through the Betfair Casino VIP Club. Participation in the club is based on points earned, with a total of 1,000 required to secure membership. Thereafter, members can advance levels for greater benefits, such as a personal account manager, monthly reload bonuses, special VIP promotions, and access to exclusive events, such as all-expenses-paid trips to major sporting events and admission to the Royal Enclosure at Royal Ascot. Levels are named after famous place: Monaco, Las Vegas, Macau, Atlantic City, and Aruba. One other way to get bonuses at Betfair Casino is by referring friends. The “Refer And Earn” (RAE) program offers up to £50 per referral, depending on which products they play. When the referred member plays in the casino, a £25 bonus is paid out. An additional £25 is awarded when the friend plays exchange games or poker, or wagers at least £25 on sports or horse racing. Worthy of note, the referral bonuses don’t cap out until reaching £2,000.